Jacque Tuyisenge was awarded player of the year honours for the month of June. After the ceremony he spoke about the club’s ambitions. Gor Mahia forward Jacques Tuyisenge believes the team has what it takes to qualify for this year’s CAF Confederations Cup quarter-final and even advance to the finals. Gor, who are currently second in Group D with five points, two points behind leaders USM Alger of Algeria, are just two games away from reaching the knock-out stages. And with Yanga return leg match coming up away in Dar es Salaam on Sunday, the Rwandese international, who was yesterday named SportPesa Premier League Player of the Month for June after scoring five goals in league matches, said their target is to reach the last-eight. “Yanga enjoy home advantage and, of course, they will come strong on us aiming to revenge last week’s defeat, but we have our own target which is to qualify for the quarterfinals. I think we have a strong and committed team with an insatiable hunger for success. 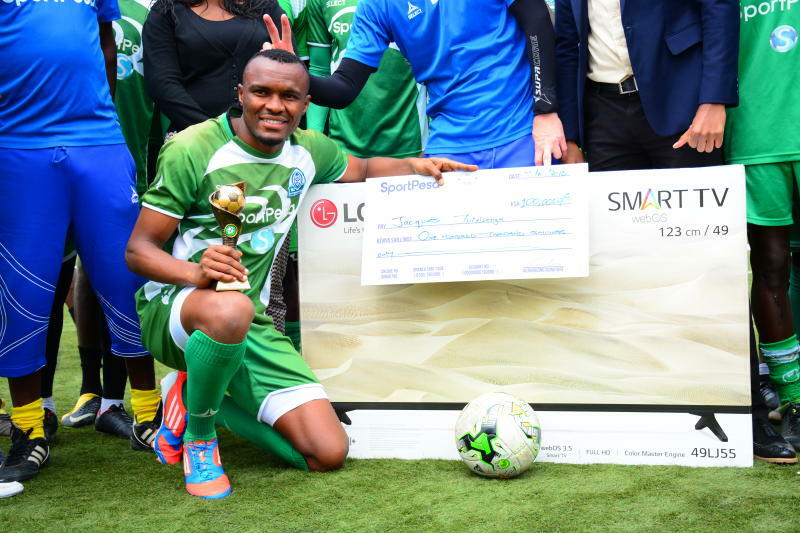 We must beat them on Sunday to make things easy for ourselves,” Tuyisenge said after receiving the SportPesa/LG sponsored personalized trophy and Sh100,000 at Camp Toyoyo. Asked if he will seize the opportunity to claim the 2018 SPL golden boot after the recent departure of leading scorer Elvis Rupia (15 goals) to Zambian Power Dynamos, the Rwandese striker who has so far scored 11 times, said: “June’s award is an indication of more good things to come. It is not easy to win such an award in a highly competitive league like SPL but I am glad my efforts have been recognized. I am happy for the good run in June and made good use of all the chances I got. I thank my teammates and coaches, this wouldn’t have been possible without them. Tuyisenge’s recognition comes barely three days after his boss Dylan Kerr scooped the Coach of the Month award. The striker saw off competition from his teammate Francis Kahata and Bandari custodian Farouk Shikhalo. congrats Tuyisenge for scooping player of the month and keep it up.